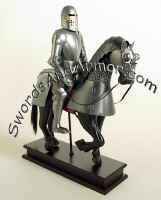 This stately miniature suit of armor looks great and is quite affordable. His diminished stature in no way compromises the fine detailed work on this miniature medieval knight suit of armor. The quality is very good. One went home with the owner immediately. It is made from finished steel and it comes as shown with the stand as shown. The suit of armor replica accessory is completely assembled and comes out of the box ready to display. It is posed on a small wooden base and has a leather-like skirt. I has the most detail of any of the miniature armor pieces we have seen. It makes a great gift or accessory piece for the home or office. we would simply have to call him "Adorable"